Jantar [ˈjantar] (German: Pasewark) is a village in the administrative district of Gmina Stegna, within Nowy Dwór Gdański County, Pomeranian Voivodeship, in northern Poland. It lies approximately 15 kilometres (9 mi) north of Nowy Dwór Gdański and 27 km (17 mi) east of the regional capital Gdańsk. The word "Jantar" comes from the Lithuanian word for amber. Before 1793 the area was part of Polish Royal Prussia, in 1793-1919 Prussia and Germany, 1920-1939 the Free City of Danzig, 1939-45 Nazi Germany. For the history of the region, see History of Pomerania. The village has a population of 1008. Beach to the west of Jantar (summer). Sea ice on the beach in Jantar (winter). ^ "Wieś Jantar » mapy, GUS, nieruchomości, szkoły, kod pocztowy, edukacja, kierunkowy, przedszkola, demografia, statystyki". www.polskawliczbach.pl (in Polish). Retrieved 16 August 2017. 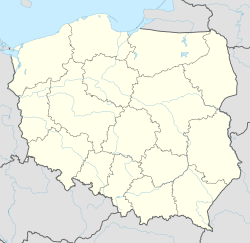 This Nowy Dwór Gdański County location article is a stub. You can help Wikipedia by expanding it. This page was last edited on 16 August 2017, at 14:06 (UTC).